The Outdoor Channel’s 2012 MadFin Shark Series CHAMPS!!! BOKELLIA ISLAND, Fla. — With heavy winds blowing the entire time, the first two days of the 2012 Madfin Shark Tournament offered challenging fishing conditions. So when the event ended in a tie, both teams qualifying for the one-day fish-off felt they’d catch considerably more sharks in better weather. A month later, both teams in the fish-off, Team Tenacity/Savage Arms (Bo Johnson and Deidra Bridger) and Team Viscous Strikes (Rob Moore and Paul Michele) felt they had enough sharks to blow away the competition. Tournament day was preceded by a pair of blow-outs, Michele’s knee and the lower unit on Johnson’s outboard. With ominous skies, the two boats ran from the countdown in different directions, Team Tenacity/Savage Arms heading south in the Intracoastal Waterway, and Team Viscous Strikes pointing offshore. Michele and Moore looked to locate flocks of diving birds over baitfish balled up by the bonito, and then drift fish the area hoping to put their baits in front of the sharks below. Fishing bonito and Spanish mackerel strips, they hooked their first shark before 10 a.m., but the blacktip was under the five-foot minimum and was released after a successful hook removal. By early afternoon, Team Viscous Strikes had two under-sized blacktip sharks and had their leader bitten off by a huge shark. Moore thought the late bite might have hurt his team’s chances of winning the event because it limited their ability to catch three blacktip sharks and then move to another location and target a higher scoring shark species. Blacktip sharks are worth 150 points, and another 150 points for successfully removing the hook. Other sharks score higher point totals, including the lemon sharks that Team Tenacity/Savage Arms were targeting. At their initial inshore fishing location, Team Tenacity/Savage Arms broke off what they felt was a big fish, then boated an estimated 150-pound tarpon that ate one of large mullet chunks the team were chumming and fishing with. At a second location, they broke off another big fish. Johnson opted for a move to another location in nearby Charlotte Harbor, where they reset their baits in 10 feet of water and were immediately rewarded with a 6-foot, 6-inch lemon shark worth 300 points for the catch and another 300 points for the hook removal. That wasn’t until 2:30, but it was still the first shark of the day to meet the required size limit, giving Team Tenacity/Savage Arms an extra 250 bonus points. Missed opportunities and lost fish added to the mental strain, as Team Tenacity/Savage Arms seemed to lose a lot of their enthusiasm and settled in to wait out the last two hours of fishing. With 40 minutes of fishing left in the event, the team had a solid hookup, followed by the release of a 7-foot, 4-inch lemon shark, the largest shark of the event and worth 600 points plus 500 bonus points. That fish was followed by a third lemon shark. 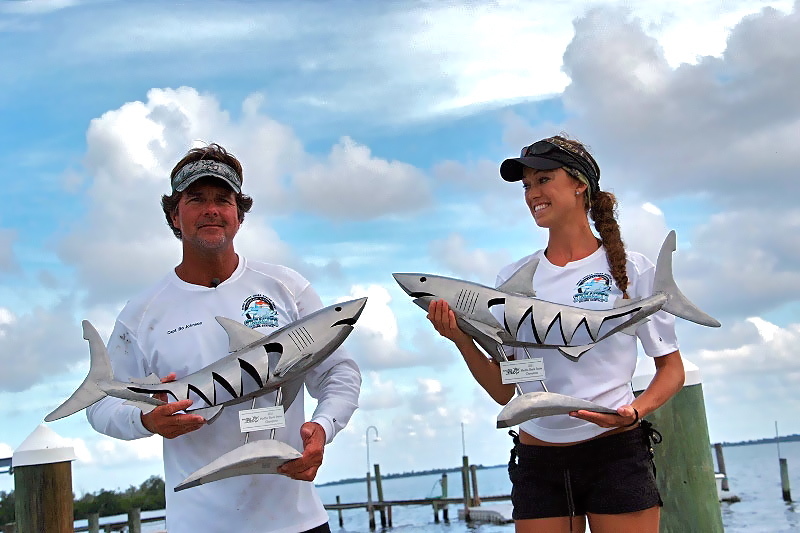 In the same time period, Team Viscous Strikes also caught two sharks, both blacktips, one of which was under-sized and the other didn’t count because the teams already had three blacktip sharks. Teams are only allowed to fill their score sheet with three sharks of the same species each day. The tension was high back at the dock, as both teams tried to surmise what their competitors might have caught. “I figured they ran out into the Gulf and probably had a hammerhead (worth 1,000 points for a catch and successful hook removal) and maybe a lemon shark and a bull shark, so I thought it was going to come down to who had the biggest shark,” Johnson said. Madfin Shark Series host and commentator Tommy Saunders lined the teams up behind the trophies to announce the scores: Team Viscous Strikes with seven sharks but only three blackfin shark releases had 900 points; and Team Tenacity/Savage Arms with three lemon sharks, plus bonus points for largest and first sharks for 2,550 points. No bonus points were awarded for the most sharks, as both teams scored three. Team Tenacity/Savage Arms is the 2012 Madfin Shark Tournament champion. Johnson and Bridger, who live together, plan to put the trophies on the mantle of their fireplace, after removing and finding space in the house for stuffed boar heads and a stuffed rattlesnake. *** Trophies by Stuart Peterman. Visit his website to see his awesome work!